The final issue of “The Client” storyline, issue five opens in Mephisto’s realm. Immediately apparent is that the artist has changed. Vince Evans, here called “Guest Artist,” has taken over the illustrating duties from Mark Texeira. Evans’ art is serviceable and he does a great job with capturing different emotions on the characters’ faces, but his art lacks the edge and atmosphere of Texeira’s work. Whereas issue #4 demonstrated the prowess of T’Challa’s mind, this issue takes the reader further into his soul. After an opening skirmish between Panther and Mephisto’s illusions, readers are brought back to the apartment where Sgt. Tork has arrived looking for T’Challa. He is greeted by Zuri, who is making a snack out of Mephisto’s severed heart. This moment of levity is quickly dashed away when Priest cuts to Wakanda. Achebe has successfully completed his coup, and the brief scene of him flinching at the sight of a wasp nearly omnipresent grin nicely demonstrates his madness. Ross’ recounting of the story is interrupted by Nikki, who questions whether or not Zuri actually ate the heart. The story beats here are nicely paced, and Ross reflects on the fact that T’Challa has told him what will amount to the rest of the issue. 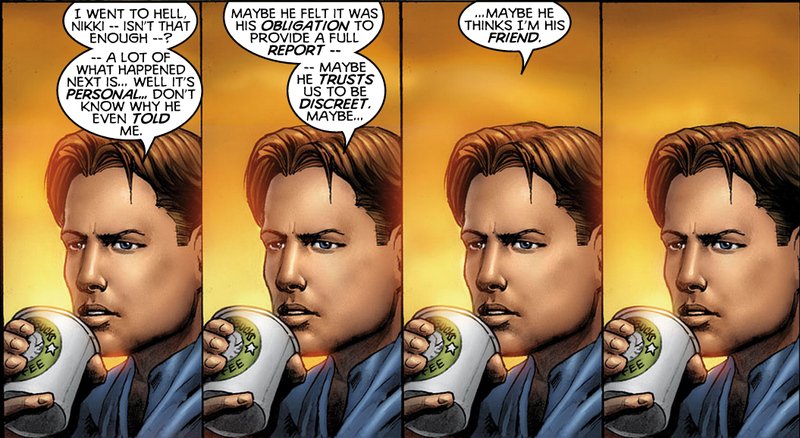 Ross’ relationship with Black Panther often parallels the relationship between the relationship between T’Challa and the reader. When Panther reveals the images that torment him to Ross, he is doing so to the reader, allowing both to get to know him more intimately. The next scene that T’Challa experiences is only a short time later. 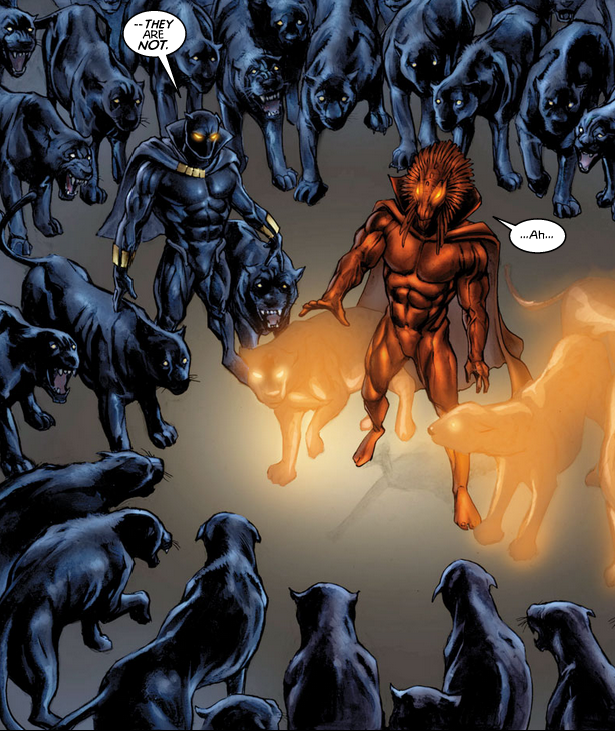 Wakanda is under attack by Ulysses Klaw, the guest that was introduced in issue three. Priest makes great use of Ross’ narration here. He allows Ross to get more verbose, focusing the reader to remain on the panels leading up to the scene’s climax, adding to the tension therein. The amount of narration and the tightness of Evans’ framing creates a claustrophobic effect, before the explosive and deadly conclusion. In spite of the horrors, T’Challa, still a young boy, springs into action, taking Klaw’s sonar weapon away from him and using it against him, allowing the Wakandan army to repel the would-be invaders. This victory is fully realized on the page; Priest generates a powerful atmosphere by cutting scenes before any retribution can be fully delivered. By ending the scenes in the low-points for T’Challa, Priest shows Mephisto’s power to drain at the soul of his opponent. How can T’Challa win when he’s being bombarded with his worst memories? 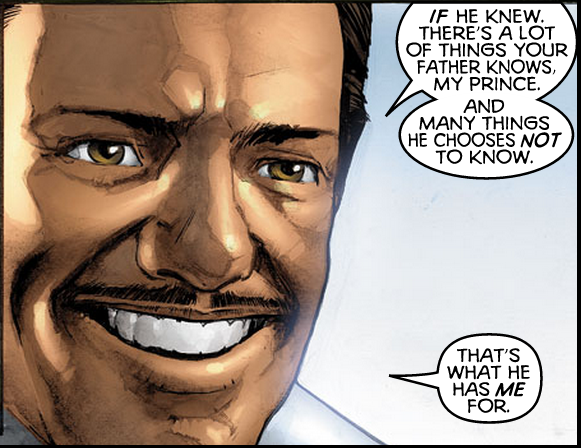 Mephisto takes one final form, that of T’Challa’s deceased father, and presents his offer. He will release his hold on T’Challa and give up Achebe, so long as T’Challa gives him his soul. T’Challa agrees, but scoffs at the terms, arguing that Achebe is still just a puppet to whoever is orchestrating the coup. As Mephisto closes in to devour T’Challa’s soul, the world around them slowly changes from Mephisto’s brimstone hell to a luscious green rainforest. Mephisto is shocked at the transition, and alarmed by the large number of black panthers surrounding them. Ross had mentioned in earlier issues that the title of Black Panther was religious in nature. Now, T’Challa reminds Mephisto of that fact. A brief flashback shows T’Challa, here a young man, in hand-to-hand combat with Zuri. T’Challa comes out of the contest on top, and the reasoning for Zuri’s deference to him in issue two becomes clear. For defeating Zuri, T’Challa is allowed to inherit his father’s role as Black Panther, connecting him not just to the Panther God, but to the souls of all the Black Panthers before him. At first, Mephisto is delighted at this prospect. Instead of devouring the soul of one king, he gets thousands. However, due to the interconnectedness of the souls, Mephisto is required to consume them all at once, and this quickly proves to be an overwhelming task for the demon. Mephisto quickly begs for T’Challa to release him from their agreement, and Black Panther agrees under the condition that Mephisto still goes ahead with his side of their bargain. Ross and T’Challa are quickly returned to the apartment where Zuri is waiting with Mephisto’s partially eaten heart in hand. In an issue that is largely about a hero’s personal demons and internal struggles, it is a thematically satisfying conclusion to see the conflict solved by a spiritual means. In the final scene of the issue, T’Challa’s stepmother, Ramonda, tells T’Challa that Achebe has agreed to share power with her as long as T’Challa remains in exile. T’Challa agrees to these terms, knowing it will be safer for his people if he does not return right away. The reveal comes when the conversation ends, and it’s revealed that Ramonda has been conspiring with Achebe against T’Challa.